May 25, 2012 – 10:05 A.M.
We continue our journey, diving deeper into the world of batter. Our third panclog: 119th St. Diner, as recommended by Jena Winne. 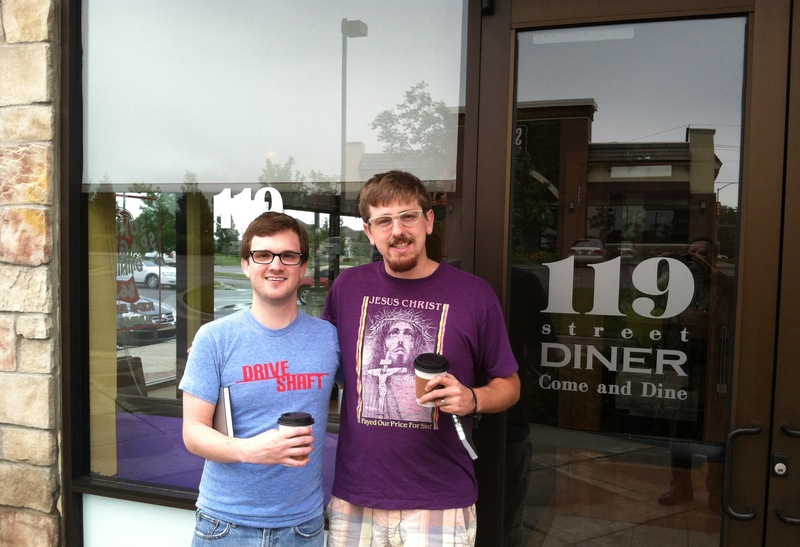 119th St. Diner is located at 14178 119th Street in Olathe, KS, behind Spin Pizza, next to Mi Ranchito. They’re open Monday-Thursday, 7am-9pm, Friday-Saturday, 7am-10pm, and Sundays 8am-8pm. You can find additional info at their website, as well as on Twitter. Location/Environment: The environment is very modern; clean and sleek. A perfect place to catch up with friends or invite the family for a weekend brunch. Jared even spotted a nice little enclosed nook in the back of the diner (not sure if this is open to all or available by reservation only). It’s casual and friendly, but also completely appropriate for a business lunch. If you’re lucky, as we were, you might even eavesdrop on some neighborhood gossip. Service: The service at 119th St Diner was by far the best we’ve encountered so far on our panclog expedition. Our server was named Jan. She was friendly, sociable and incredibly generous. She checked very frequently, but not too often, to see if we were doing alright or needed a top-off on our coffees. We were even brought free scone samples after we ordered. Part of our order had a small mishap, but they were happy to friendly and efficiently fix the problem (more on that below). It’s clear warm, superb service is their goal and they surpassed all our expectations. We asked the manager to take our picture after our meal. He was more than happy to, and determined to get the perfect shot. We tried three different locations and finally took one outside (the above photo). Menu/Selection: If you’re a fan of Eggs Benedict, this places seems to be a must. They boast their 19 varieties of Eggs Benedict on their menu. They offer a very wide variety of both breakfast and lunch options; a great choice for a large group of people with different tastes. You’ll find pancakes, eggs, burgers, soups & salads, and much more. 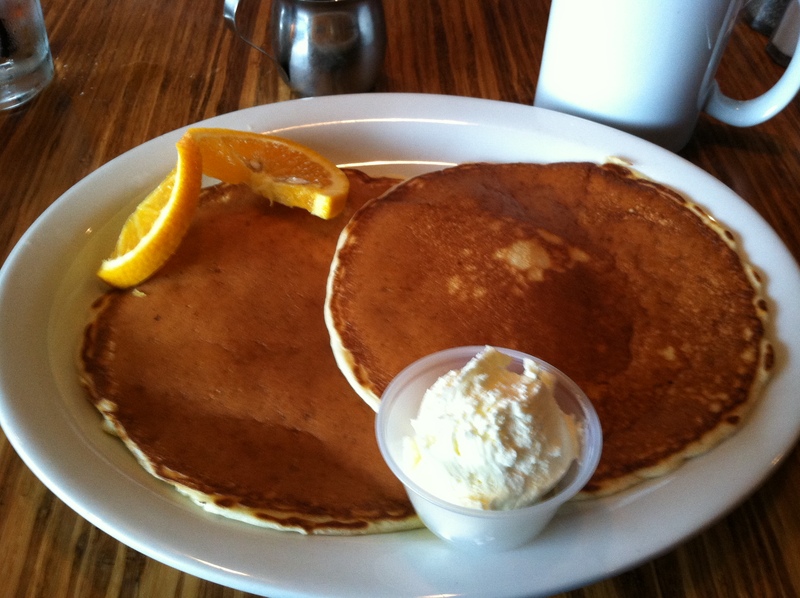 Sour Cream Pancakes… What does that make you think of? Something gross? Something old? A weird substitute to normal cream or milk? I was thinking all of these. I won’t lie. I was nervous about this panclog expedition. But once I sunk my teeth into that first bite of soft, creamy cake, my mind changed. I was incredibly surprised and ashamed that I was not even aware of this beautiful twist of the old fashioned flapjack. The presentation was refreshing. 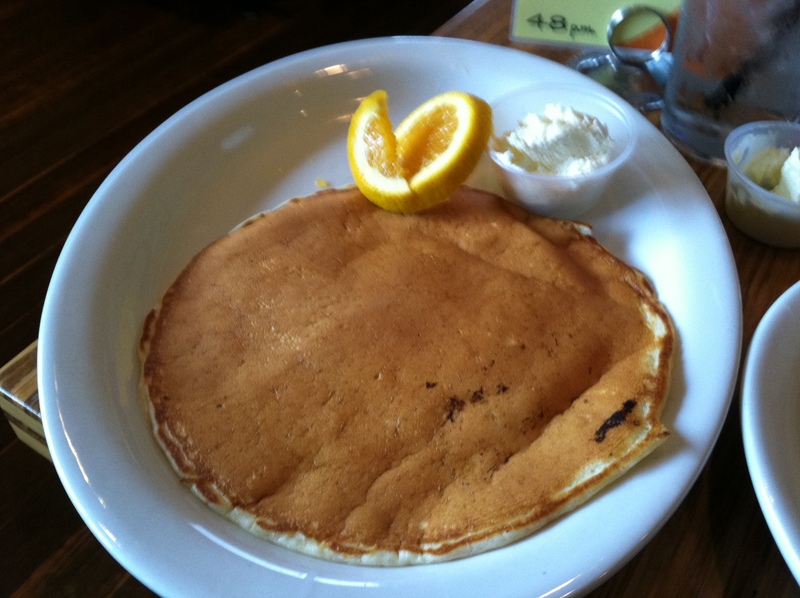 You often see the boring run-of-the-mill plain pancakes on a white plate. Or even worse plain pancakes on a white plate but with random greenery on the side. 119th Street Diner added something useful to the plate. An orange twist. This is not only delicious in and of itself. It creates a very necessary flavor break when eating straight starches. These pancakes were creamy and rich. I would recommend them to everyone and their 2nd cousins. 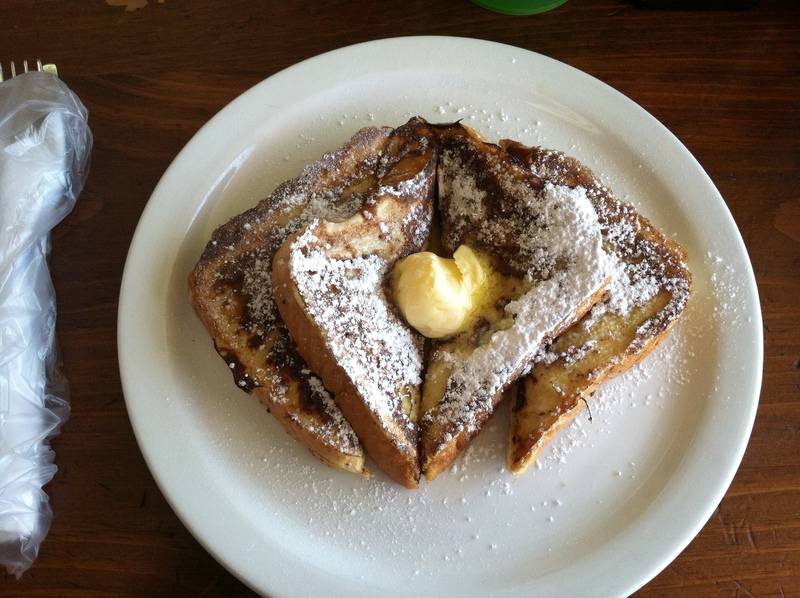 I’ve reviewed pancakes and french toast for panclog. What’s next? I felt that it was my breakfast duty to order a Belgian waffle. I always found the distinction between pancakes and waffles very simple: one has pockets, one doesn’t. 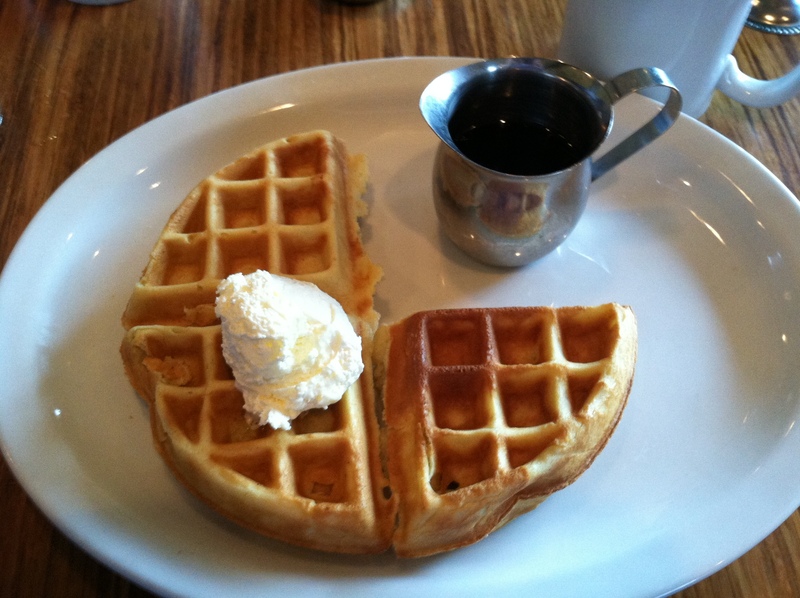 I enjoy a thick, large Belgium waffle with a big hunk of butter and pockets filled with hot maple syrup. I found 119th St. Diner’s Belgian waffle to fit the bill. A large, fluffy, super filling piece of griddled batter. You might look at the above picture and say, “hey, that looks like only 3/4 of a waffle, where’s the rest?” Our server notified me that my Belgian waffle got trapped in the griddle, sadly 1/4 did not make the journey to my plate. However, they gave me another WHOLE additional Belgian waffle (seen below)! I found the first 3/4 waffle incredibly filling, and was only able to eat an additional 1/4 of the second waffle. This ended up being very nice for panclog, because Jared was able to try a generous quarter of the second waffle. It was a satisfying meal, however I didn’t find that the waffle really had a distinct or strong flavor. It wasn’t really a let down or a surprise, I feel that most waffles are pretty common in their taste, but it’s worth noting. Price: The pricing might be slightly higher than you’d find at similar restaurants, however noting the service and environment, it’s appropriate. The overall experience is well worth the price. It’s almost guaranteed you’ll have a smile on your face upon leaving. Overall: The food isn’t absolute breakfast perfection, but what really makes 119th St. Diner rise above many similar places is the friendly service and warm environment. It’s a great example of an all around great eating experience. With a diverse menu and exceptional service, it’s definitely a place we want to return to in the near future, perhaps for lunch. 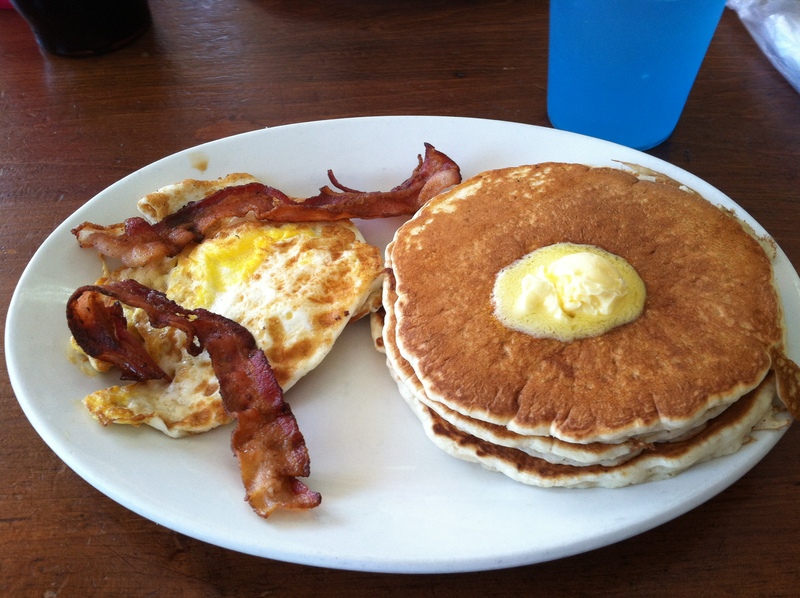 May 22, 2012 – 10:40 A.M.
Our second journey in pancakehood took us to Le Peep Restaurant. 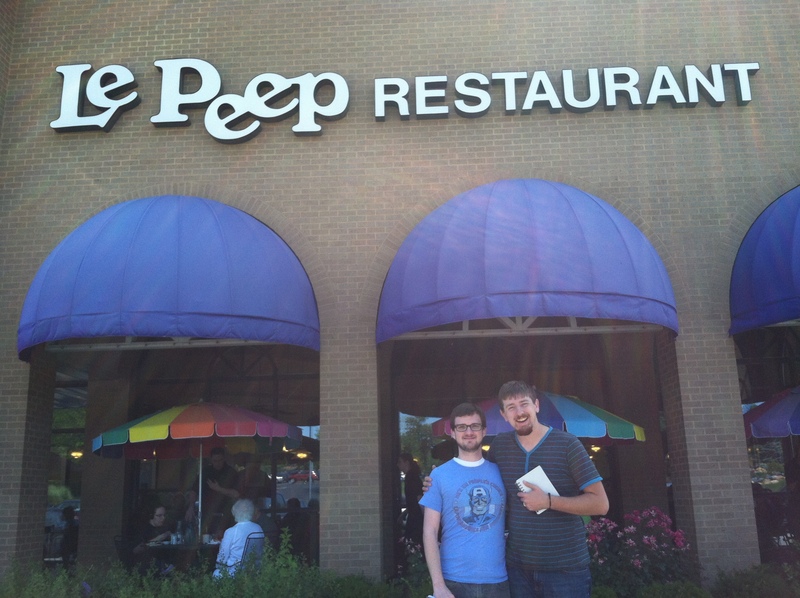 Le Peep is a chain restaurant with three locations in the KC area, and numerous locations nationwide. We visited the location at 7218 College Blvd (corner of College & Metcalf) in Overland Park, KS. Their hours are Monday-Friday, 6:30am-2pm, and Saturday-Sunday, 7am-2:30pm. They’re on board with many social media/apps, including Foursquare and Frontflip. Additional information about Le Peep is available on their website, as well as Facebook and Twitter. Location/Environment: Our visit was on a Tuesday, before the lunch crowd. We were seated immediately and the restaurant was only sparsely filled. However, it felt busy. It wasn’t quiet, it wasn’t overwhelmingly loud. The atmosphere felt like something of a corporate brunch. The feel is perhaps a little disingenuous. They seemed to have slightly missed the mark of the hometown niche feel they were attempting to achieve. Thus creating a somewhat false, corporate facade of such a place. Better for the 9-to-5ers. Le Peep does offer outdoor seating, weather permitting. Service: The service was minimal, neither poor nor outstanding. Our server felt rushed, seemingly concerned with only getting the job done. 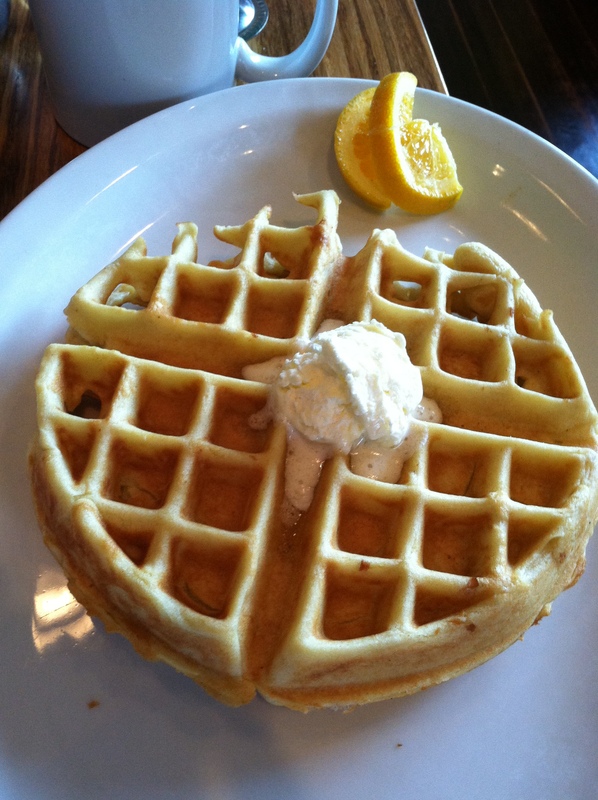 Menu/Selection: Le Peep offers a wide selection of both breakfast and lunch meals. From cereal to burgers, they’re sure to have something for everyone in your party. The menu is laid out very well, separating pure breakfast from lunch. They offer a full espresso bar while you’re waiting to be seated. This surely would come in handy on busy weekends, easing the wait when seating times can be lengthy. I wanted to branch out and try some nice flavored pancakes. In the past year, I have grown a great appreciation for the nut of almond. I also believe that cranberries are good for you. This is what led to my decision for Cranberry Almond pancakes. So the pancakes were presented in a way that looks a lot like the picture above. The pancakes were of a nice size. They looked like they made regular pancakes and threw the almonds and cranberries just on top of it. The pancakes were served with a huge dollop of whipped butter. I really enjoyed the fact that the butter was whipped. Whipped butter is much easier to spread than regular butter. The pancakes were served with delicious hot maple syrup. After the first bite my initial thought about the presentation was deemed true. There were virtually no almonds nor cranberries in the pancakes. This saddened me. These pancakes were of standard taste. Priced at $6.99 this meal is in average of higher-end breakfast eateries. 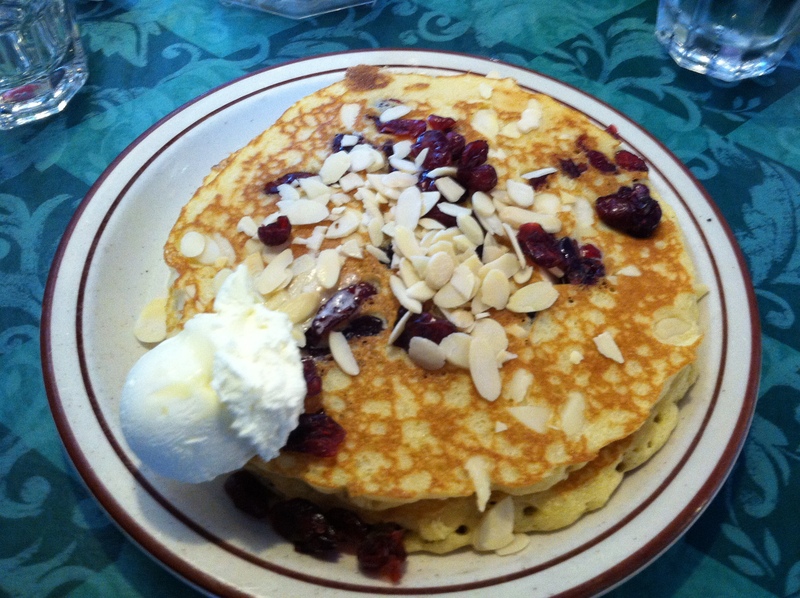 Cranberry Almond pancakes are a great choice for someone who is hungry but doesn’t want to feel like they have a food-baby. Cranberries and Almonds are both easy going flavors which makes them an easy combination. I partook in some coffee intake whilst pancaking. The coffee was good but Le Peep did not have any flavored creamers. My pancakes were normal. There were no outstanding qualities to these pancakes. I enjoyed them but I didn’t fall in love. Ordering blueberry, chocolate chip, or similar pancakes can be a mystery of sorts. Many places put the additional ingredient straight into the batter. IHOP even uses chocolate pancake batter in their chocolate chip pancakes. I personally enjoy my blueberries or chocolate chips included in the batter, thusly melted and delicious inside the actual pancake. 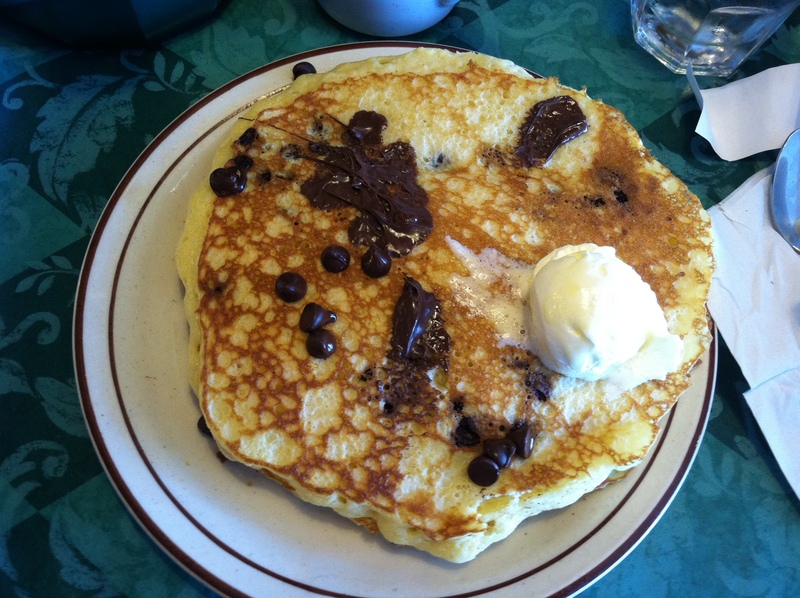 Le Peep’s chocolate chip pancakes were not so. They were two quite delicious, plate filling flapjacks with a smattering of chocolate chips on the top, accompanied by a generous dollop of whipped butter. Despite the lack of creative batter mixing, it was quite enjoyable. However, I’m not sure how much I truly tasted the pancakes. The mixture of chocolate, hot maple syrup and butter coating the pancakes is a bit overwhelming, particularly the chocolate chips (although the coffee was a nice accompaniment). It’s a rich, filling mixture. I finished the plate, absolutely stuffed and perhaps just a bit sickly. Priced at $6.29, I felt it was adequately priced seeing the quality and portions provided. Price: The price is on the higher side of equivalent restaurants. The portions are generous and the quality is there, but you might be looking at over $10 by the time you add coffee or a side. They do have a loyalty punch card (Clucks for Bucks) that offers a $10 credit after spending $100 (through combined visits). We were glad we visited on a Tuesday, seeing that Tuesdays are double punch days. 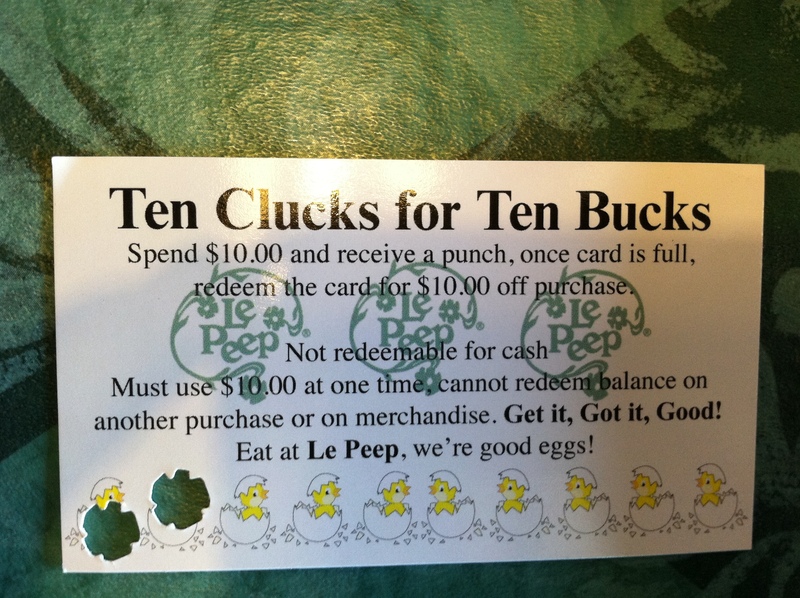 It’s not something we would particularly go to Le Peep for, but if you’re spending the money you might as well. Overall: All things considered, we enjoyed the experience, but found much to be desired. All aspects of the meal were adequate but nothing more than that. We would return, but only at a guest’s request. May 15, 2012 – 11:00 A.M.
We decided to start our pancake conquest by taking a recommendation. Being the beginning of our journey, we simply are not aware of every breakfast joint in the KC metro area. Recommendations are vital to a start up such as the Panclog. The Panclog-ologists were recommended Gomer’s Chicken by Carrie Freuck. Gomer’s Chicken is located at 615 E 99th Street. Kansas City, MO 64131. Gomer’s would most likely be placed in the Hole-In-The-Wall category. They serve breakfast until 2pm daily, although they are closed Mondays. Gomer’s currently does not have a website, although they do have a Facebook page. Location/Environment: Located at 99th & Holmes, Gomer’s is an easy destination to find. Upon arrival, it’s quickly evident that Gomer’s is the epitome of a “hometown chicken joint.” It’s quaint; it has that small town charm. From the moment you walk in, you feel as if you’re at Grandma’s house for breakfast. Plastic wrapped silverware and jumbo neon plastic water cups are what to expect on the table. There’s a radio on, but what you really pick up is the soft hum of local chatter. Service: The feel is no sham, as you’ll find the service is perfectly complimentary to the environment. It’s fast and friendly, as if you’re part of the family. Not overly chatty but very hospitable, warm, and sincere. And flexible as well, happy to accommodate a substitution or tweak in a meal. You can pay at the table or the counter, very laid back. Menu/Selection: The menu is limited to what you would think of being at a fried chicken joint, however the selection is admirable. The breakfast menu carries all the major players in the breakfast group (pancakes, waffles, biscuits & gravy, French Toast, etc. ), as well as all your common sides (bacon, hash browns, eggs, however sausage was nowhere to be seen…). If you happen to be visiting for lunch or dinner, they do have the local rarities of chicken gizzards and hearts. Being the man that I am, I knew that pancakes would be my choice before we even got out of the car. Pancakes are my forte. I ordered the three pancake combo. The combo includes obviously three pancakes, two eggs (I chose over-hard) and two slices of bacon. The plating was great. They laid the bacon right over the eggs, just how I like it. Everything was on one plate. This seems important to me for no reason at all. As long as the plate doesn’t look cluttered, use one plate. The pancakes were of a very nice size. These were incredibly fluffy without being light. The pancakes were of original buttermilk flavor. They had just the perfect amount of butter to cover all of the pancakes. Gomer’s carries only maple syrup. These pancakes had a great initial taste offering. This taste was present up until the ¾ mark. Then the pancakes started to taste somewhat stale. This must be due to a molecular breakdown caused by the syrup’s PH level dissolving the yeast in the pancakes. I do not find this pancake problem everywhere but when I do, I am fairly devastated. This nice combo was $6.59. I believe this is a good price for the amount of food I received. Solid Breakfast. I ordered the standard French Toast without any accompanying sides. I’m a French Toast aficionado, my favorite being the thick, home-style Texas toast right off the griddle. I wasn’t disappointed. Two thick slices (cut in half) served with a dusting of powdered sugar and a generous dollop of butter in the middle. The batter was a sweet, not overpowering mixture that really held the “flavor of the griddle.” A perfect mixture of the batter and bread mixed with the accompanying butter and syrup. The texture had the perfect balance, not too loose or dense. The melt in your mouth style of French Toast that I’m always looking for. The portions were decent. I would’ve been stuffed if I had gotten the accompanying bacon and eggs. At $4.39 (a few dollars more if you would like to upgrade to the combo), it was a good overall value. Price: The pricing of Gomer’s was fair and reasonable. We believe that this is standard pricing within the Breakfast industry. 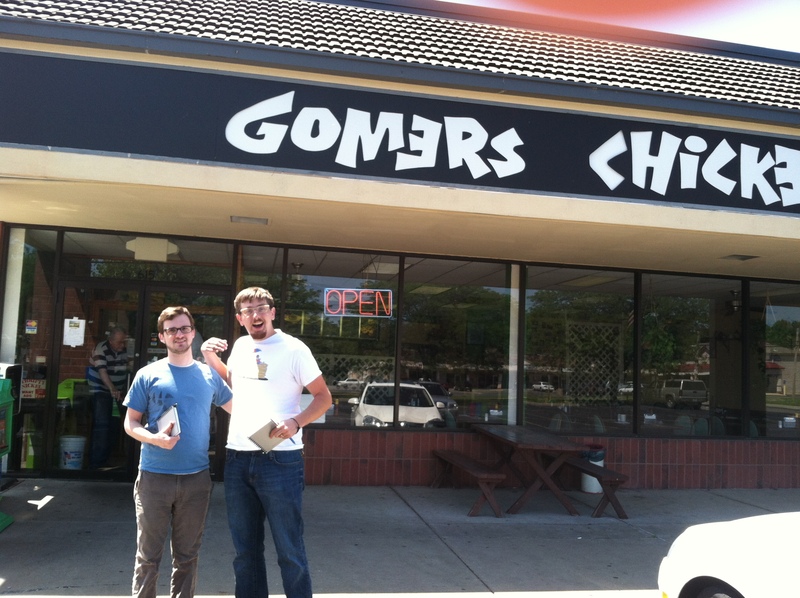 Overall: Gomer’s Chicken was a great experience and a wonderful launching point of the Panclog. Good Food, great service, awesome environment. A solid breakfast destination. We would both definitely return.